Yet another generation of tech-savvy workers—the post-Millennial group known as Generation Z—will soon enter the workforce. Recruiters and hiring managers should be aware of this group’s attitudes and expectations of office norms: it could have a significant impact on recruiting efforts in years to come. This group, born in the 1990s and later, have work preferences that in many ways align more closely with Generation X than Millennials, according to an 8×8 and Koski Research survey of 1,000 respondents across the United States. 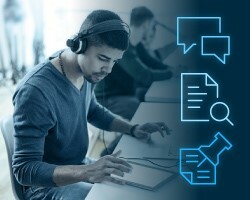 While less than 20 percent of Gen Z respondents said they are likely to use traditional “Gen X tools” such as email or landlines for work, they’re also less inclined to use the messaging and chat apps preferred by Millennials. Given Gen Z’s heavy emphasis on effective communications versus convenience, there’s a high likelihood that they won’t want to operate in silos. “[Gen Z wants] things to work across the board, and they also want to be able to use the same tools and devices they use for their personal life at work,” Signore said. The majority of all respondents (56 percent) said they would prefer to use the same tools for work as in their personal lives. In addition, workers are increasingly mobile-centric, with desktop devices assuming a secondary role in the daily workflow. The results of the 8×8 survey reflect similar findings in a report from human resources specialist Randstad and research and consulting firm Millennial Branding, which found that 53 percent of Gen Z respondents prefer face-to-face communication over tools such as instant messaging and video conferencing. Kathy Van Pelt, vice president of strategy marketing for Randstad Technologies, noted that Gen Z appears to be more loyal to their current employers than Millennials, with 29 percent of Gen Z’ers planning to stay at their current company between three and four years, compared to only 25 percent of Millennials. As she explained, Gen Z is also interested in incorporating more cutting-edge technologies, including wearables, virtual reality and robotics. Access to social media is likewise a must—not to mention a direct conflict for the more than half of U.S. employers that currently block social media access in the workplace. “And unlike their more seasoned peers, Gen Z considers things like telework and flexible scheduling to be a given, not an exception reserved for a select few,” Van Pelt added. Keep all of this in mind as a younger generation enters the workforce. Got a Hilarious Recruiting Story?